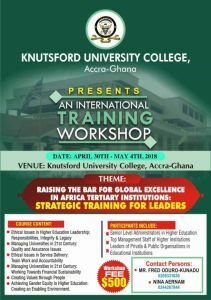 Knutsford University College, one of Africa’s prestigious University Colleges affiliated to the University of Ghana-Legon, is offering a well-tailored transformational leadership training and development for the next generation of African leaders. Resource persons have been carefully selected to ignite a transformative and innovative thinking in service delivery in a competitive environment, a panacea to progress of Higher Educational institutions in today’s Africa. We are also pleased to inform you that adequate logistical provisions for your comfortable stay in Ghana have been put in place. We are confident that your participation in this workshop will enhance your knowledge and skills in service delivery in today’s competitive environment. Looking forward to seeing you for the workshop.